On Tuesday morning, two explosions hit Brussels international airport, and an hour later, another hit a busy subway station. The Brussels attacks have left just under two dozen dead and over 100 injured. A stunned Belgium has come together to show its support for the victims — as well as their resilience, despite such a devastating loss. 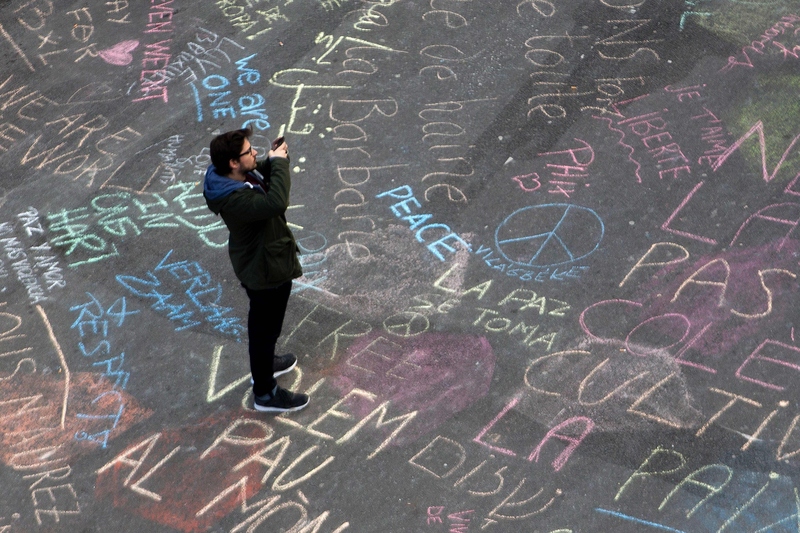 Though Belgium's capital, and the rest of the world, have united to show support for the city, some citizens have began to share their thoughts on the attacks in Bourse square, writing them out in chalk. These chalk tributes to the Brussels attacks are both haunting and beautiful. The airport has been put on its highest alert, as flights in and out of Brussels have been canceled. Public transportation around the city has also been put on lockdown to avoid further casualties. While these attacks follow the capture of Salah Abdeslam — the man believed to have been involved in November's Paris attacks — in Brussels, the incident has not yet been cited to be connected to that incident. A Belgian prosecutor told the Belgian Public Broadcaster VRT that the explosions were caused by a suicide attack, but as the country continues to take all the necessary safety precautions, the citizens of Brussels have a message for terrorism. See some of the sentiments written out by citizens below. The chalk tributes exemplify the feelings in Brussels following such a horrific attack. The city refuses to let the attacks break them, and have banded together to share both messages of love and expressions of pain and sadness. Security is still on high alert all across the city, but it seems that these citizens are committed to keeping the discussion alive during such an important time.